If you're looking for an efficient, environmentally responsible way to generate power for your camper, it's a good idea to investigate whether or not installing RV solar panels is a good option for you. What Are RV Solar Panels? Solar panels are devices that convert energy particles to electricity. They can be installed on all types of dwellings and other structures to produce clean, safe, and free renewable energy. Solar panels work by storing energy from the sun that can be used at a later time as electricity. There's no need for fuel to power them; once they're installed you're assured a constant source of no-cost power for your RV. Solar panels are free to operate and require only minimal maintenance to remain functional. When your camper has RV solar panels, you'll be able to use them to power the unit's appliances and lights. You won't have to rely on your battery or finding campsites with the right type of electrical hookups to enjoy comfortable RV camping. You also won't have to depend on a generator, which is loud, smelly, and expensive to operate. If you've decided to install solar panels on your recreational vehicle, you'll need to spend some time thinking about how you currently use your camper as well as how you plan to use it in the future. If you primarily use your camper on weekends, your solar panel needs are very different from individuals who travel for several weeks at a time or even longer. If you think that you might start spending more time camping in the future than you currently do, be sure to select a solar panel system that you'll be able to expand without a great deal of difficulty. Choose a system that will allow you to install additional panels or another solar panel kit if you want to do so. Look for a solar panel kit that is designed to be used on a recreational vehicle, and select one that provides a sufficient amount of power for your energy needs. 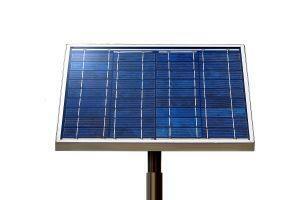 Prices of solar panel kits for RVs vary greatly depending on the size of kit you need. Prices range from less than one hundred dollars for individual panels to several thousand dollars for extensive, powerful systems. Mr. Solar: This company offers several options for RV owners. The company has expandable solar panel kits to meet the needs of casual campers as well as those of full time RV'ers, with options ranging from 10 watts to 440 watts. PPL Motor Homes Parts Store: You can order Go Power solar panel systems and expansion kits from PPL. Silicon Solar: This company's RV Maxx kits for solar energy are designed to provide campers with the energy they need to power their campers during trips of all lengths. Wholesale Solar: This company carries several complete RV solar kits designed to be used on campers or boats. Their kits are pre-packed, so you don't have to worry about whether or not you'll have everything you need to get your RV solar panels installed and operating when you choose one of Wholesale Solar's kits. Many RV owners opt to install solar panels on their campers. You are the only person who can decide if doing so is in your best interest. Preserve your battery and reduce the need for gasoline or diesel generators by choosing solar panels.